What About Our Relationship With Money? We discuss several different types of relationships here on this blog. But an important one that we’ve never mentioned is that relationship we have with our money. Sadly, not many people have a good or pleasant relationship with their finances. They work hard, and for long hours, only to see the fruit of their labour flushed out of their possession in the form of bills and spending at the end of each month. I’ve been thinking about spending quite a lot recently, and ways in which so much of what we lose can be saved and utilised for our own benefit. 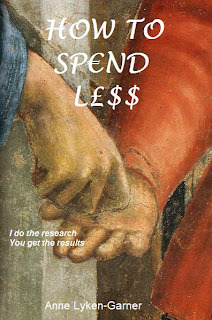 I’ve been researching and constructing a book I called, ‘How to Sp£nd L€$$’ for the past four years. I haven’t included any of my findings here at the Relationship Supermarket, but my completed book is now available at Smashwords, for free downloads (as a limited offer). As many of you know, I’ve spent four years of active research uncovering well-kept secrets which will help the average family spend less on food shopping, household bills, entertainment, large purchases and arbitrary outgoings. I’ve acid-proofed all the examples given in this book so you don't have to do any of the hard work. I hope you'll have a look at it and tell one friend about it too. It’s available here. There is also a facebook fan page here. Thanks so much for your continued support. I can promise one thing, This book will help you with your relationship with money.